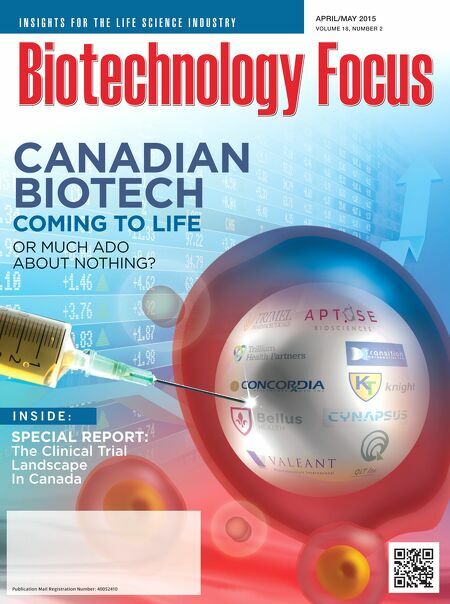 Biotechnology Focus is Canada's leading authority on Canada's life science news. From biopharma and healthcare to ag-bio and clean tech, our readership includes life science professionals, C-level executives and researchers. I N S I G H T S F O R T H E L I F E S C I E N C E I N D U S T R Y APRIL/MAY 2015 VOLUME 18, NUMBER 2 Publication Mail Registration Number : 40052410 SPECIAL REPORT: The Clinical Trial Landscape In Canada I N S I D E : CANADIAN BIOTECH COMING TO LIFE OR MUCH ADO ABOUT NOTHING?